Flooring and floor care can be both a financial challenge and time consuming, especially when you have so many other tasks that demand your attention. Our purpose is to answer your questions, provide options and make purchasing, installation and maintenance as easy as possible. We have added a new section which outlines reviewing all the elements you need to create a studio floor system. As the manufacturer we can offer you the best price possible because there are no middle-men. We make no deals because every price quote is the best deal. 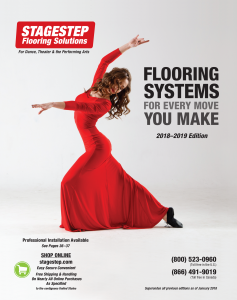 Stagestep is the only flooring company that posts all its prices. We believe in transparency and we guarantee those prices are the lowest for comparable products or we match it. For your convenience we take all credit cards, wire transfer and checks. We also work with a finance company and take no fee or commission. Stagestep has a 50,000 square foot warehouse stocked with inventory which translates into shipping 90% of our orders within 72 hours. We have been introducing innovative products for 45 years making us the oldest and largest dance floor provider in the USA. Now with partners in England, Australia, Singapore and South America, we service the world. We introduced the floating wood subfloor to the dance community in the 1970’s. We invented SlipNoMor, Springstep IV, Encore flooring and FloorShield Color Finish. Our goal is to marshal the resources and information you need at a valued price so you can get on with what you love to do.